The music got rockier as the musicians became more familiar with each other, musically speaking. Adrian Fisher wanted to "butch things up a bit" and long endings with guitar solos became the norm, for a while. Adrian Fisher usually got to do guitar solos as outros but they were quickly faded during ecordings. The arranging was fairly democratic and Martin Gordon worked on arrangements with enthusiasm. Martin Gordon confess one of the reasons why he took such pleasure in the thing was that he recognised the Ron Mael's stuff being fabulous pop writing. Nevertheless he provoked a complaint at one point that one of his outros was overshadowing the rest of one particular song. The Maels were becoming nervous about his input. After the recording of "Kimono My House" album, live rehearsals for the coming tour took place in a large gloomy cinema in Fulham. This decaying edifice was known as Manticore and was owned by supergroup Emerson Lake and Palmer. It was dark depressing place, and the seats have been removed but not replaced making the place more ballroom-like. 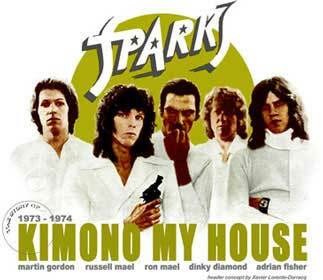 During the recording of "Kimono My House" additional tracks were used, mostly for different keyboards and Sparks needed an additional keyboardist to be able to reproduce things from the record live. So on the 16th of February 1974 there was an audition for the extra musician. At his audition, Peter Oxendale presented his card replete with his academic qualifications (LRCAM, RAM, POTN), and Adrian Fisher remarked "Are you a Sir or something, all these bleeding initials ?" So Peter Oxendale became, to all intents and purposes, a Sir. When he joined Sparks, Peter Oxendale invited his girlfriend along. Peter's Hammond organ was placed at the side of the stage, effectively obscuring him from view. 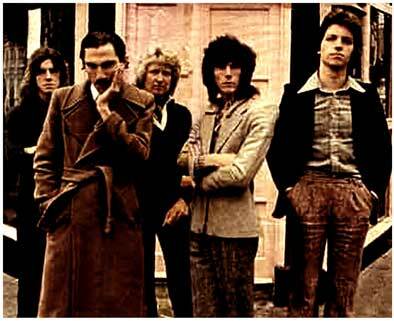 Because is girlfriend could't seen him, the keyboardist began to trot out from the wings between each song under the pretext of asking Russell Mael what the next tune was. Of course, the musicians all had bits of paper with the titles written out in order.